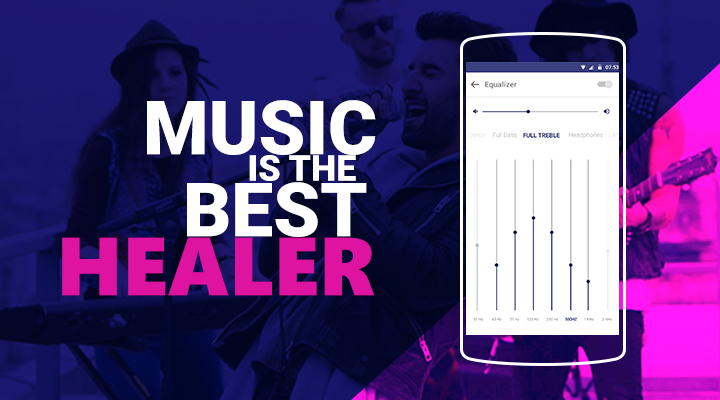 For someone who loves listening to music, VuLiv delivers more than just sounds. It’s becomes boring listening to the same music repeatedly all the time, it’s time to elevate your listening experience! For music lovers, higher the sound quality, the more soothing it becomes for the ears. VuLiv can take your mood to a whole new level, you will be surprised to know that VuLiv offers a beautiful Equalizer with not just 1 or 2 or 3 but 18 pre-sets excluding a custom option. You all must have felt sometime like tuning the sounds a bit to jazz up the party however never knew which frequency to set to. VuLiv’s got your back! There are over 18 pre-sets to choose from, be it a party or a candle light dinner with your loved ones or a fun long drive with friends or working out in the gym, just adjust the knobs and make your music sound the way you love! This is a must have app for all the audiophiles and trust me you will start loving their favorite songs even more! Even people who don’t like listening to music will find this feature really over whelming and will develop interest in music on a mundane basis.